Video Gait analysis is the systematic study of walking or running. Using slow motion film it is possible to view joints in each phase of movement to assess if function and alignment is normal. Gait analysis is used to assess, plan, and treat individuals with conditions affecting their ability to walk. It is also commonly used in sport to help athletes run more efficiently and to identify posture-related or movement-related problems in people with injuries. Feet are amazing machines, managing without complaint most of the time to transmit the weight of the body as we propel ourselves around at varying speeds, all the while keeping balance and a secure connection with the surface. While foot posture can vary greatly without particular painful problems, many alterations in foot posture can result in painful symptoms and significant levels of disability. The levels of force transmitted through the feet demand strong and flexible joints, muscle strength and neuromuscular coordination for balance and control. The term ‘gait’ is used to describe how your legs and feet act when you walk and run. It includes may factors, including how your weight moves from side to side and front to back, the way your legs move at the ankle, knee and hip, the way your foot flexes and twists and how your feet strike the ground and lift you off it. As you walk and run with a normal gait, all these factors act in a regular cycle, repeating smoothly and evenly with each step you take. Your gait is determined by a number of factors. These include the shape, length and strength of your bones and joints, the length and strength of your muscles, tendons and ligaments - and the way all these work together during movement. A normal gait will be economical, using the minimum amount of energy to walk or run. Why should I have my gait assessed? Gait analysis can be useful in preventing, diagnosing and treating pain and injury connected with abnormal gait. Gait assessment may be useful to diagnose the reason for pain you encounter while walking or running. Gait analysis can be used to plan needed foot surgery to achieve best results. 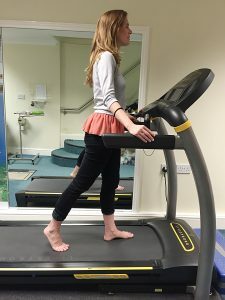 How is my gait analysed at my initial consultation? One of our qualified podiatrists will look after you during this consultation. 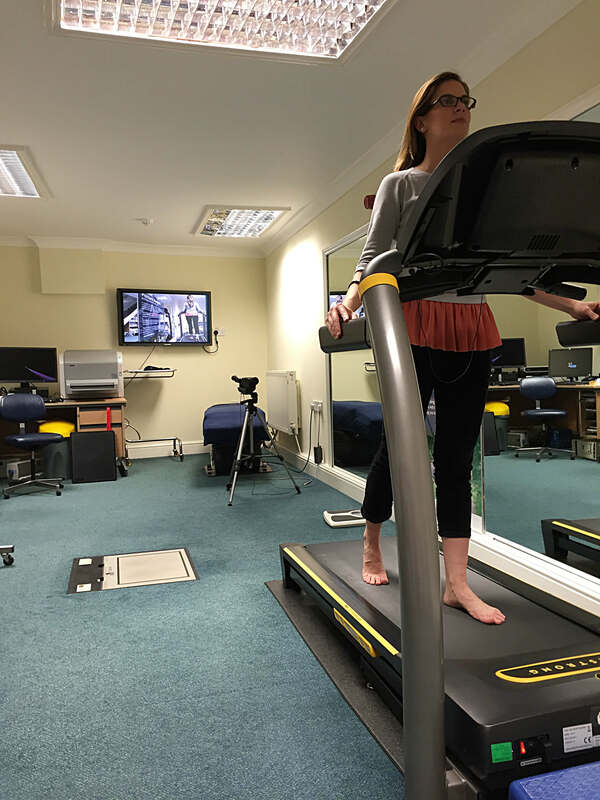 Gait analysis usually involves being filmed walking on a treadmill. If you have a sports injury we may also ask you to run on the treadmill. We will ask you to undress and just keep your underwear on, so do wear underwear that you feel comfortable being filmed in. We ask you to remove your outer clothes so we can assess your feet, knees, hips, pelvic tilt, shoulders, arms and back alignment. While on the treadmill you will be filmed from the front, back and sides. The film will be replayed in slow motion and freeze frame to assess each joint while you are at your appointment. Will I be offered further gait analysis? You will be advised of your initial diagnosis and we will either recommend a particular course of treatment, or suggest further investigation to enable us to make a fuller diagnosis. 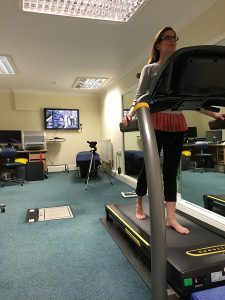 This may be a biomechanical assessment, a fuller gait analysis using our computer pressure plate technology which lets us more specifically assess individual joints and muscles. We might also advise an X-ray scan, which we can do in-house, or an MRI scan for which we will refer you to a specialist centre. If, at your first consultation, our podiatrist recommends handmade orthotics, and you agree to this, an appointment will be made for a pressure plate analysis. For further details of what is involved, read about Costs for Orthoses below. Please also see Your first appointment. With an abnormal gait, some of the factors mentioned above will be such that your gait is uneven, asymmetrical, inefficient or painful. For example, if one leg is longer than the other or one foot flatter than the other, your gait becomes asymmetrical, and behaves with different timing from one side to the other. This can lead to overuse muscle syndromes, muscular weakness and joint pains. Apart from the conditions (unequal leg length, unequal arches) mentioned above, abnormal gait may be caused by a range of biomechanical abnormalities arising from injury, accident, congenital conditions, and by other pathologies. What is a Pathological gait? Your movement may reflect an underlying problem caused by a stroke, arthritis or a neurological condition such as cerebral palsy or be different due to the results of a stroke. The study of your movement and gait allows diagnosis and intervention strategies to be made, as well as planning for rehabilitation. What harm can poor gait biomechanics do? Many injuries in normal people are often caused, at least in part, by poor gait biomechanics. You may just feel that your posture is deteriorating but have no specific pains in your legs and feet. Runners and athletes whose sports require a high level of running and jumping should make sure they have had a gait analysis and buy the correct footwear to avoid future overuse injuries. Read more about how gait analysis can help your running. Here is a link to our page on children's problems. What can be done about abnormal gait? Abnormal gait leading to painful walking or running can often be treated with orthoses – foot support insoles which can prevent you from overusing certain structures and so help you recover from your problem. For more acute conditions, such as recovery from a fracture or serious ankle sprains or muscle tears, a cast may be indicated. Physiotherapy and Osteopathy may be recommended to help with balancing muscle use or skeletal alignment, and may be combined with exercise recommendations. For conditions where surgery is indicated, gait analysis can be used to plan the surgery. Contact us to make an appointment for a 45-minute initial gait assessment - use the contact form or call us on 020 7627 4901. Gait Analysis can give crucial information about running styles. When running the foot rolls inwards allowing the arch to lower. This movement is caused pronation. Everyones' feet need to pronate to absorb the impact of running on hard pavement an even on softer surfaces like grass, otherwise our feet and legs would hurt. Gait analysis assesses the amount of pronation you have. Too much pronation causes strains, such as shin splints and runner's knee. If you proante more on one foot then the other it can cause hip and back pains. Too much pronation causes the knee to turn onwards too much when running. This can cause pains in your thighs called Ilio-tibial band syndrome and Knee cap pains (lateral tracking patallae). The goal of gait anaysis for runners is to identify the cause of the problem and provide a re-balancing exercise program to treat your muscle ad tendon pains and to assess if you gait could be improved by foot orthoses prescribed to return you alignment to a normal symmetry and alignment. Bring your trainers to your appointment so we can make sure you have the right type of shoe. Some people do not have enough pronation. This type of foot is called a supinated foot and often causes many pains in the joints from the foot, and knee to the hips and the back. Gait analysis aims to identify how your joints move and to start treatment to enable less jarring to your joints by altering your running style. This is achieved with exercise programs to rebalance your muscles and tendons and by providing foot orthoses to make the best of your gait alignment. 'Fitter Feet' Podiatrists will discuss which is the right type of shoe for you. Remember to bring your trainers with you so we can check them for you. The aim of gait analysis is to treat muscle and joint pains by identifying poor alignment and to give treatments to improve your running style and to help you succeed in the sport you love most. Gait Analysis can be used to plan foot surgery. Some Foot deformities can seen and assessed with x-rays. The additional of gait analysis test shows how the deformity is used when walking and shows how much pressure is under the deformed part of the foot. Gait analysis allows the surgeon to take into account abnormally high foot pressures and the way the foot is used, when planning surgery so that the best results possible are achieved. Orthoses are foot support insoles that are made from a cast of your foot and contain a prescription in order to change the way you walk. They can prevent you overusing certain structures and so help you recover from your problem. If it is agreed that your treatment will include the supply of orthoses, Fitter Feet for Life can provide either hand-made or standard orthoses. Read more details here. Casts prevent movement and help fracture healing. They can also be used to help the recovery of severe ankle sprains, muscle tears & to aid the recovery of degenerating tendons & ligaments. Where possible, Fitter Feet will issue a removable 'Air Cast' so that you can sleep without a cast. It also allows you to wash and inspect your leg. Three half-hour sessions with our physical therapy team to treat the abnormalities revealed by the biomechancial evaluation. Many of our hand made orthoses have a life time guarantee! One pair of Commercial Orthoses: These orthoses last about a year, and are sometimes called 'temporary orthoses'. They are not ‘hand made’ for you, but they are accommodated for you by heat moulding. They also have additional medical wedges that are added to custom your orthoses. They are tailored to treat your symptoms. One Review appointment: Fitter Feet offer a free review appointment after four weeks of use. At this appointment your pelvic alignment will be reviewed to make sure your orthotic prescription allows normal symmetrical movement and that your legs are equal in length. Small adjustments can be made at this appointment if necessary with no further charge.